The arcade games are one of the most popular games played on smartphones. But all these games were immensely popular in the past as well and for anyone that likes to remind himself of these classic arcades now he can do that directly on his phone. The virtual arcade machines can offer you all those classic arcades you played in your childhood and enjoy them again. We searched and we have one great virtual arcade machine with different classic arcade games for you. Let’s see what the game offers. What is this virtual arcade about? This highly entertaining and addictive virtual classic arcade game is offering all arcade lovers different arcade games in one place. Developed on the Android platform, easy to play and keeping the player interested in any of the games, the virtual arcade machine is offering the players a chance to have fun playing and in the same time win real prizes for their achievements in any of the games. Players can collect tickets or play games to win real prizes and get the prizes shipped to their address fast. Hours of fun playing a variety of fun arcade games. 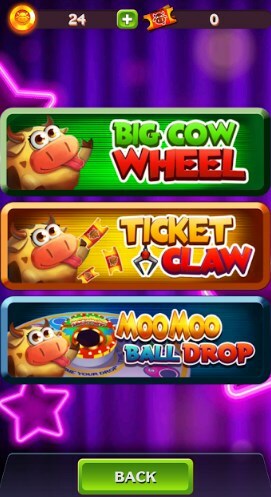 Why do we choose MooMoo Arcade? MooMoo Arcade has to offer the players 4 different virtual arcade games to choose from like MooMoo Claw, MooMoo Claw 2D, MooMoo Keymaster and MooMoo Stacker. The games offered on the virtual arcade machine have a different type of gameplay and offer different achievements for each player. The players will enjoy the cool sound effects and HD graphics in each game they choose to play. The player has chances to win real prizes in any of the games he chooses to play or he can win prizes by collecting tickets offered. All the prizes depend on the arcade game chosen by the player and his achievements in each game. Many minor and major prizes the player can win by playing or by collecting the tickets and using them for different types of prizes. The prizes which the player wins will be quickly shipped to his address without wasting his time. Endless fun and entertainment offered to each player while he plays and uses his chance to win many real prizes for his achievements or for his tickets collected. Download this game for free on Google Play to play classic virtual arcade games available in one place!